Just west of the dock at the Institute of Ocean Sciences, the Saanich Inlet array lies in 100 m of water. Operating since 2006, this fjord network was the first comprehensive cabled ocean observatory in the world. A remotely operated vehicle (ROV) is deployed from the deck of the Canadian Coast Guard Ship, John P. Tully and lowered to the bottom, where it can access and service the instrument suites connected to the network. Research here includes benthic ecology, plankton dynamics, and monitoring complex seasonal biogeochemical cycles. At each station, VENUS maintains a standard instrument platform hosting a range of oceanographic sensors, monitoring water properties (temperature, salinity, pressure, and dissolved oxygen) and the concentration of plankton in the water column (measured by an inverted echosounder). 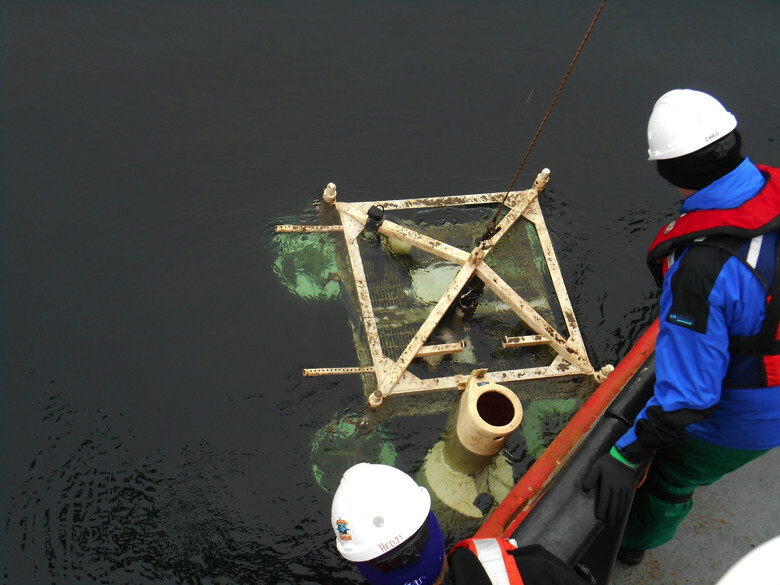 The instrument platform at Saanich Inlet is recovered for maintenance, 6 March 2014. On this expedition, we will also recover a sediment trap that has been collecting the organic debris sinking through the water column. The crew will also recover a specialized instrument built for researchers at Oregon State University by Rockland Scientific, a Victoria high-tech company. They have been studying the flux of heat and oxygen out-of and in-to the bottom, respectively. This group has future plans to deploy similar instruments in the Strait of Georgia in 2015. After a brief stop to service systems in the sheltered waters of Saanich Inlet, the ship will head into the more dynamic environment of the Strait of Georgia. Here the ocean is influenced by strong tides and winds, and supports a busy seaway of shipping traffic. Three separate sites will be serviced in the Strait, including sensor packages at depths of 110, 170, and 300 m depth. First up is the shallower research station near the mouth of the Fraser River, referred to as the Delta Dynamics Laboratory. The influences of both fresh water and sediment brought down out of the mountains by the Fraser are monitored here. A standard suite of sensors will be serviced (temperature, salinity, pressure, oxygen, currents, acoustic backscatter, and turbidity), and three specialized instrument systems will be deployed here; including a seismic liquefaction in-situ penetrometer (SLIP), a suite of acoustic Doppler current profilers for measuring turbulent bottom boundary layer processes, and a new hydrophone array for monitoring slope instabilities, ships, and marine mammals. Scientists, technicians and engineers discuss preparations of the Delta Dynamics Lab prior to deployment near the mouth of the Fraser River, 3 May 2013. From left: Chris Sundstrom, Paul Macoun, Richard Dewey, Kevin Bartlett, Martin Scherwath, Denis Hedji, Gwyn Lintern. Photo by Ed McNichol. Intermittently, the Tully will be servicing the deeper sites in the Strait of Georgia, northwest of the Tsawwassen Ferry Terminal. On this expedition, the ongoing forensics research program, continuous since July 2006, will be maintained. In September 2013 two pig carcasses where deployed in front of a camera at 300 m depth. Drs. Gail Anderson and Lynn Bell of Simon Fraser University will join the ship as day passengers to recover any bones that remain. The ship will then reposition over our station at 170 m depth, where two new pig carcasses will be lowered to the bottom and placed in the view of a networked camera, starting a new series of interactive viewing opportunities for the researchers to monitor deep-ocean degradation over the next 6 months. Finally, there will be base oceanographic measurements made during the cruise, in the off-hours when ROV operations are suspended at night. These include using 2 sophisticated ship-mounted acoustic survey systems, one a multi-frequency echo-sounder for mapping out spatial distributions of fish and plankton, and the second an acoustic Doppler current profiler for surveys ocean currents. Spatial surveys conducted by the ship at night using these sonar systems have been requested by researchers at the University of British Columbia and will complement the similar fixed-point measurements made on the observatory installations in the Strait of Georgia. In addition, the ship is equipped with a CTD-Rosette on a long winch wire, which can be lowered through the water column to measure seawater conductivity (C), temperature (T), and depth (D), and collect water samples for analysis of dissolved oxygen. CTD stations throughout the Strait of Georgia will be sampled at night to characterize the regional oceanographic conditions. 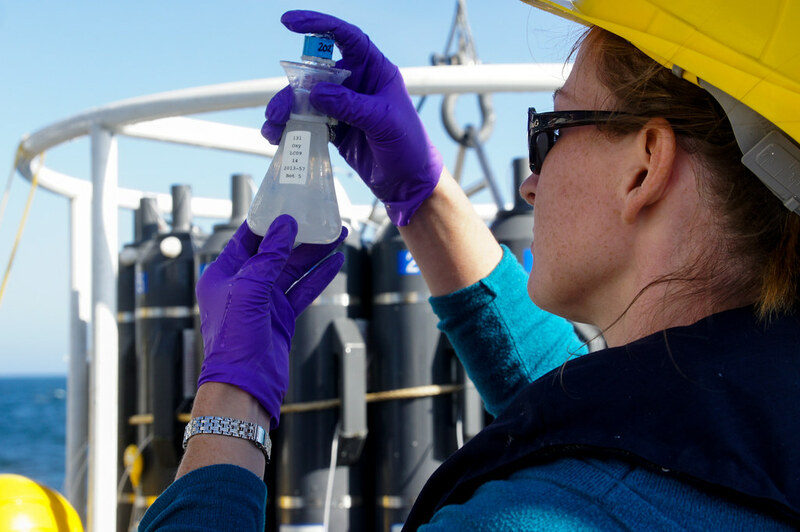 Karen Douglas looks for bubbles in a water sample gathered by CTD-Rosette, August 2013.